This moderately high resolution view of Jupiter's icy moon, Callisto, shows two, probably related, phenomena that were quite surprising to planetary scientists. First, a dark, mobile blanket of material covers Callisto's surface. 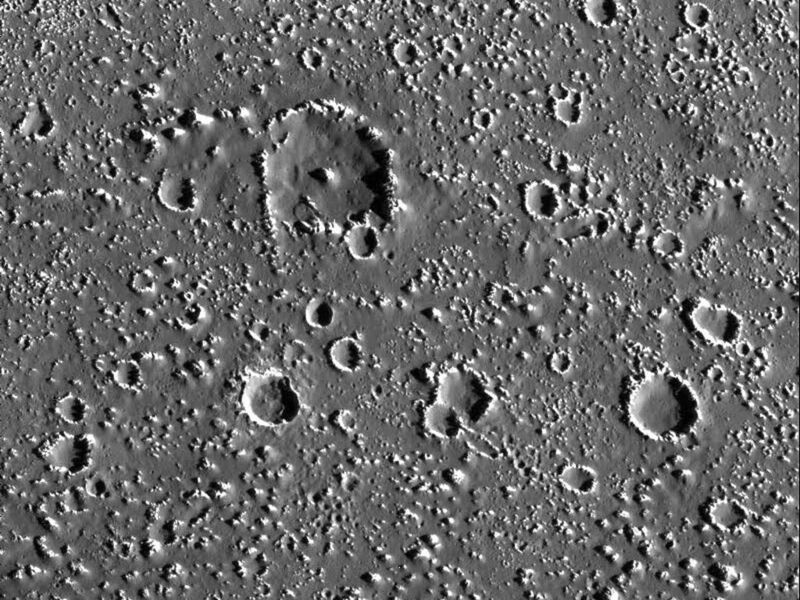 Movement of this material occurs on slopes, as seen here on some crater walls. 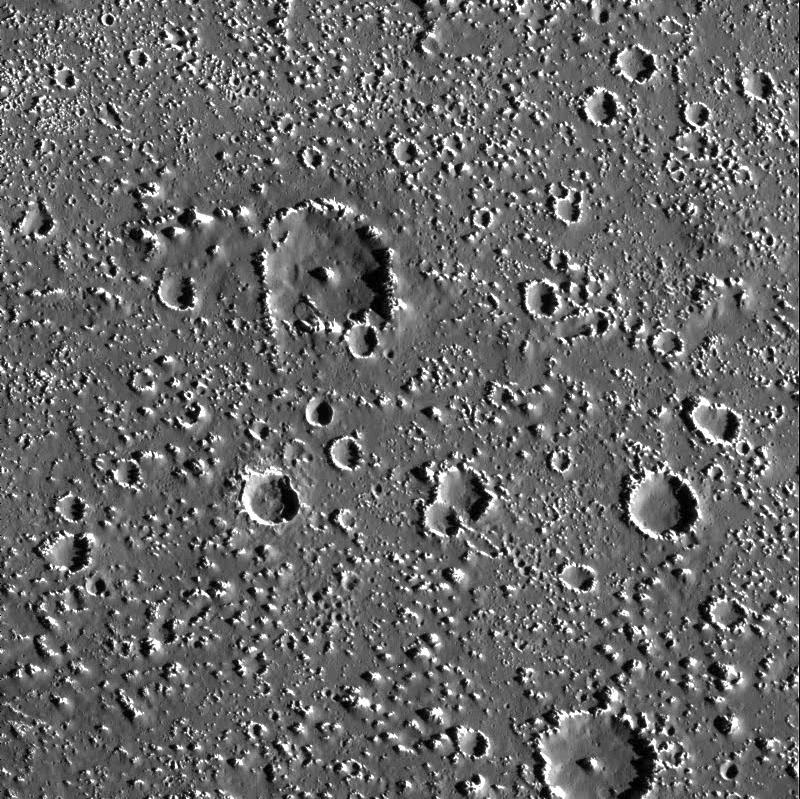 Second, while Callisto has a significant number of large craters, it lacks the related number of small craters which are seen in the crater size distributions of other similar bodies in our solar system. 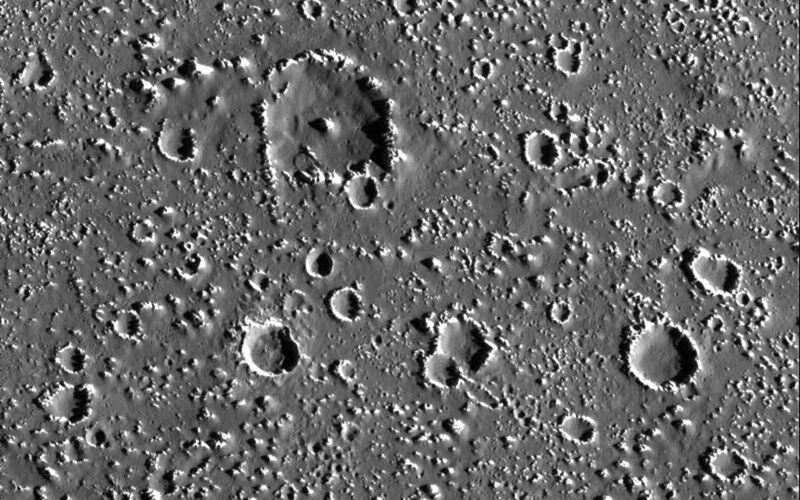 Small craters near slopes would become filled in by the downward movement of the dark material, but what erases the other small craters? One alternative is that the population of potential impactors around Jupiter has fewer small objects than previously expected. North is to the top of the picture. The image, centered at 17.5 degrees north latitude and 142.1 degrees west longitude, covers an area approximately 74 kilometers (46 miles) by 75 kilometers (47 miles). 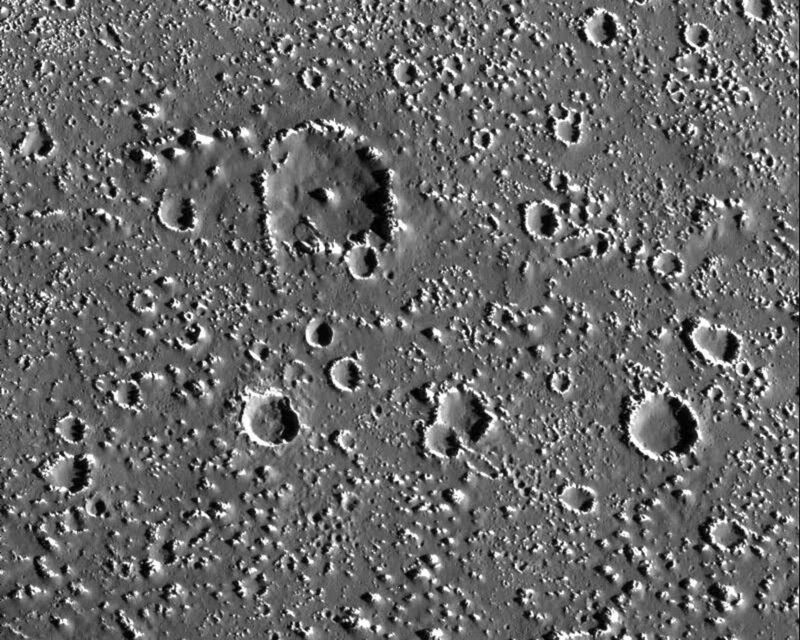 The resolution is about 87 meters (285 feet) per picture element. The image was taken on September 17th, 1997 at a range of 8600 kilometers (5330 miles) by the Solid State Imaging (SSI) system on NASA's Galileo spacecraft during its tenth orbit of Jupiter. The Jet Propulsion Laboratory, Pasadena, CA manages the Galileo mission for NASA's Office of Space Science, Washington, DC. This image and other images and data received from Galileo are posted on the World Wide Web, on the Galileo mission home page at URL http://solarsystem.nasa.gov/galileo/. Background information and educational context for the images can be found at URL http://www.jpl.nasa.gov/galileo/sepo.